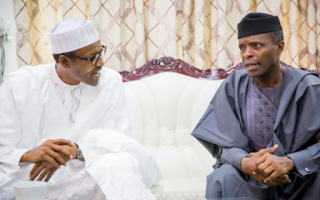 Home Politics President Muhammadu Buhari’s 4 Year Plan For Nigerians – VP, Yemi Osinbajo. President Muhammadu Buhari’s 4 Year Plan For Nigerians – VP, Yemi Osinbajo. Vice President, Yemi Osinbajo, has disclosed the focus of President Muhammadu Buhari’s administration in the next four years will be to address, among other things, the deficiencies in the quality of human resources caused by poor education and healthcare. Speaking at University of Lagos where he delivered the Convocation Lecture, the Vice President, said that the government will adopt strategies that prepares young Nigerians for emerging challenges as well as opportunities. I may begin by affirming the belief of the Buhari administration that Nigeria’s prosperity means a decent existence for all. Second, that prosperity so defined will be attained if we are able to address the issues of extreme poverty, productivity, corruption, the rule of law and the deficiencies in the quality of human resources caused by poor education and healthcare. We must have a robust enough healthcare system that ensures that the average person is in good health, an educational system that guarantees education capable of preparing children for the opportunities and challenges of a knowledge economy. In planning the path to prosperity we also took into account the age-old weaknesses of the Nigerian economy and the illusion of prosperity that frequently distorts our understanding of the actual fragility of our economy. He said it was clear to the government from the beginning of their tenure that they needed to devise an economic plan that prioritized the basic issues with our economy. For us, we needed to prioritize; the building of infrastructure especially rail, roads, power and ports; productivity as we diversified the economy from oil and gas; the fight against public sector corruption; developing a new educational curriculum that emphasizes Science, Technology, Engineering, Arts and Maths. Others include; adopting a new approach to resourcing healthcare; putting in place a social investment programme that deals with issues of extreme poverty and unemployment. Our Economic Recovery and Growth Plan effectively addressed these issues. He reiterated that Nigeria was under the right leadership committed to lead Nigeria towards prosperity. If we stick to our agenda in the next two years we will see the most significant improvements, in our power sector. Industrial Infrastructure is a major component of our economic transformation plan. Project MINE (Made in Nigeria for Export) is the major plank of our industrial policy. The idea is to build Special Economic Zones which accommodate industries for local manufacture of goods for which Nigeria has a comparative advantage. These include cotton, garments, leather ware etc.